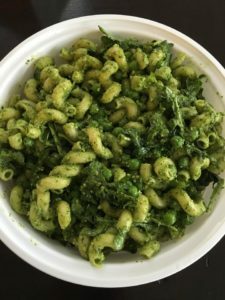 You will love this flavorful recipe for pasta salad, perfect for summer cookouts, workplace lunches, and weekend picnics. Taste the bright flavors of the Mediterranean in every bite of this light, wonderful green summer salad. Pair this with a crisp Sauvignon Blanc or your favorite Rosé. and gently pat it thoroughly DRY with paper towels. notably superior texture it produces. Set aside. instructions. Then drain it and rinse in cold water. cheese. Pass the bowl and enjoy!